The Wedgewood Heights area of Woodbury is a conglomeration of nearly 1000 distinctive properties, divided into 20 neighborhoods, each with its own architectural personality. It was in 2012 when Mark moved into this community. The home he selected was just over a decade old and had substantial curb appeal. While the roof had passed inspection, its shelf life was quickly coming to a close. The last straw for the roof was a hail storm that damaged the shingles beyond repair. Mark reached out to us for storm damage restoration and advice on the most aesthetically pleasing, long-lasting roof we could provide. After strategizing with our team, here’s the conclusion he came to. GAF Timberline Ultra HD® Shingles: The size of an asphalt roof is measured in squares. 100 square feet constitutes each square. While the average roof tends to fall around 30 squares, Mark’s was nearly 50. 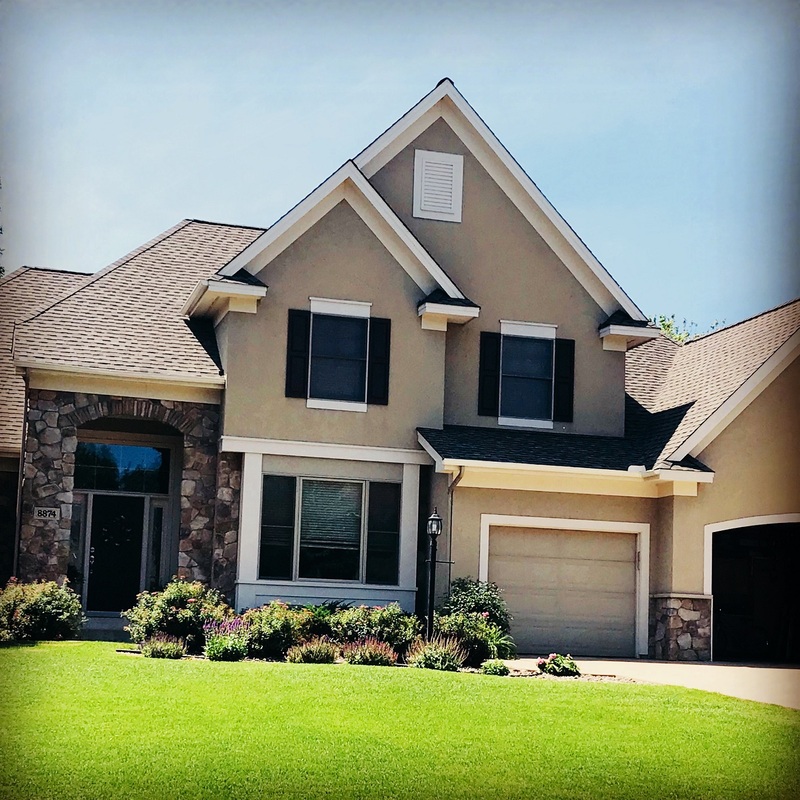 Having such a sizable roof, coupled with the home’s alluring architectural features made it crucial to select a roof that would be aesthetically pleasing. Of additional importance was the selection of a roofing system that would better stand the test of time. For these reasons, we felt confident offering GAF Timberline Ultra HD® Shingles. While many roofing manufacturers proudly tout their line of “architectural shingles”, the Timberline Ultra HD® line offers more peace of mind. For one, these shingles are nearly double the thickness of ordinary architectural shingles. This gives them a more pronounced and refined appearance. Secondly, they’re manufactured with a technology called StainGuard Plus™. This proprietary technology ingrained into the shingles acts as a preventative to ward off unsightly algae growth on a roof. One of the biggest perks of selecting this line of architectural shingles is the refined and modern colors they’re offered in. Whether a homeowner wants a deep brown, rich red, or vibrant gray, the request can be accommodated. In Mark’s case, it made the most sense to opt for Weathered Wood. This modern, yet rustic tone tied in beautifully with the home’s rock accents, shutters, and deck. While there’s so much to appreciate about this roofing system, the most prevalent is the fact that it’s backed by an industry-leading, 50-year, non-prorated warranty that covers both labor and materials. Equally as impressive is the fact that it’s earned the Good Housekeeping Seal of approval. "Very professional. Used them twice to install gutters...separate phases...prompt, courteous, and did a great job explaining the details and also cleaning up after install. Recommend!! - Kim Q. "I appreciated the communication. We needed a gutter on the back of our house to protect our new deck." - Mike M.
"The installers came out and they were very friendly and got the job done quickly and accurately. The ladies who answered the phones were friendly and professional. The accountant was very helpful with the many question I had. I would hire them again." - Sherry B.